Following up from yesterday’s post, it seems like a good time to talk about “soul days”. You are not made from the clothes you wear, the car you drive, or the house you live in. Really look deeper into your internal makeup and determine who you are on the inside. Truly knowing yourself is critical to achieving your dreams. One way to learn about yourself is to participate in activities that require you to channel your creative side. Use art supplies, music, dance, anything that will help you reconnect to a deeper part of you. Go on a Passion Quest. For a period of time, use passion as a barometer for deciding what you will and won’t do (when choice is an option). Over the course of the next few days, whether work-related or during personal time, notice what excites you versus what drains you. Reignite your passion by simply doing more of what you love. Notice any tension you’re facing right now. Imagine it drifting farther away as you slow your breathing, relax your body, and quiet your mind. Carve out this quiet time to listen to a part of you that rarely gets heard. Beneath the daily turmoil, hear the wisdom in your whispers. By taking a break each day to relax and listen to yourself you will find that you reach a heightened sense of awareness that allows you to visualize your future more clearly. Sunday morning in yoga. I always arrive with my mind full of thought and leave in a very clear space. This morning, the teacher talked about how we are either falling to pieces or falling to peace. Falling to pieces takes a lot of thinking. The mind gets filled with thought, and the thinking that the thought means something. We live in a world where we are bombarded with ‘stuff’ which can lead us to fall to pieces. But that’s not our only option. We can choose to fall to peace. Falling to peace happens when your mind is full of chaotic thoughts, and you let the thinking go. In essence, you fall into peace. A space of nothingness. And in the space of nothingness, what emerges is inner peace. Peace is your factory default. Gerald walked into my office. We scheduled a coaching intensive. Coach until complete. Gerald’s mind and life were in overdrive. A successful entrepreneur with two businesses, Gerald was allowing one situation to so overpower his thinking; he felt on the verge of breaking down. And he was not succeeding. We talked about the situation and peeled it back to see where he was giving his thought ‘power’ and why he was falling to pieces. Thought creates story. Story often begets story. When the thought arises from an old story of pain, a story which parallels the current situation. Usually the story is so old, most are not aware of the impact of these old stories on their current situation. Through peeling the ‘thought onion’ back, we got to a core wound; an old situation which was not resolved. And this unresolved thought and the associated heavy emotion was tainting the current situation. In doing some work, we came to a place of peace around this core wound. Then from this space of peace, we looked at the current situation and Gerald just sighed. The solution was soon present and relatively simple. What emerged was a smile. And peace. Gerald returned to his life, empowered and back on track. Falling into peace can occur. Whether it is in meditation, in yoga, or through coaching. 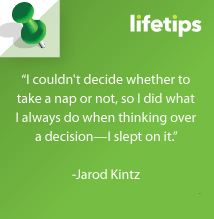 Today, be aware that most of the problems we create are the result of over active thinking. Life happens; it always will. 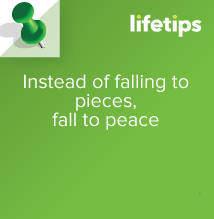 As life happens, are you going to fall to pieces or fall into peace? Remember, peace is your birthright. Are you in search of your guru? Someone you can model yourself after, someone that can fill that empty space inside of you? Perhaps you think you’re simply not enough, and deeply wish to emulate someone who is. You seek a guru to follow and to adore. And in doing that, you’ve lost who they are. Or perhaps you’ve found a guru. This guru may have seemed perfect at first. He or she may have seemed to have it all. But eventually, you realized that even your guru isn’t perfect. And what did you do? You began searching for another guru, and in the process lost yourself and even your faith in humanity. Stop. It is time to pause and take a deep breath. 1. Go to a mirror and close your eyes. 2. Spell guru out loud while your eyes are closed. Spell it 3 times out loud. 3. Open you eyes and say hello to YOUR guru. YOU are the guru you seek. When you realize the power you are and the power your have, YOU become the guru you seek. The world created you – perfect, authentic, and having the ability to tap into the wisdom of the ages through confidence, clarity, and courage. The world asks that you fully become you. Be the best you ever. YOU are all you need. YOU are what those around you want. No one wants you to become a clone to another. They have their gifts, allow them to be who they were intended to be, and YOU become who you want to be. Now, you may find guides, coaches, and teachers along the way. Learn about you through them. True teachers bring out the best you and then send you on your way. True teachers do not allow themselves to be worshiped. They appreciate acknowledgement and they are humble, confident, and clear in all their intentions. So this year, find your true guru. Hint: it is YOU. When you accept that, you will find your passion, step into you natural gifts, abilities, and talents. And, it is the teachers, guides, and coaches who assist you to polish the facets of your beings such that you shine. Yes, it is time to shine – fully and completely. So this is YOUR time. BE your brilliance. BE your shine. Live life fully, as your own guru. If you really want to turn your life in a different direction, you need to assess what is really going on in your career, relationships and family. The purpose driven life revolves around the powerful process of exploring what’s been left unsaid, undone or incomplete in your life. To be driven, you must remove the challenges that are encumbering your success. This process is really one of the most awesome things you can do to free yourself and give yourself access to your dreams. Completing what is undone–whether it concerns family, friends, work, your body, mind or soul–may be the most profound thing you have ever done. Take these steps to begin living a purpose driven life. 1. Scrutinize your life and your life purpose. 2. Explore your body, mind, home, work, finance, and people (living and dead). 3. Write down what you feel incomplete about with anyone or anything and what you need to do to complete it. 4. Complete as many items as possible. 5. Write a letter or make a phone call. You might need to create a project plan. Create measurable goals and try to stick to your plan. You will find yourself feeling better and lighter every day! Everyday we wake up we are asked to take on roles and responsibilities. Sometimes we have a choice in the matter, while other times we don’t. Oftentimes, we don’t want to let people down around us, so we say yes to whatever it is they ask of us. But do we follow through? Not always. It is better to say no and let that person down in the moment, than say yes and let that person down in the future, once they’re counting on you. For example- lets say you agree to go to dinner with an old friend after work one evening the following week. The day of, you’re exhausted, have piles of work sitting on your desk, and you no longer feel like going anywhere but home once you leave the office. So you call your friend and ask for a rain check. Your friend is polite and says no problem, but what if that’s not how they feel at all? What if your friend passed up plans with someone else because he gave his word to you that he would meet you for dinner? By flaking out, you are telling the other person ‘you are not as important to me as I am to you.’ They may think twice before scheduling something with you again. Over time this leads to missed opportunities and broken friendships.